Never has the question “How’s it hanging?” been so literal. At MAC Media Day 2015, I asked college football players an age-old question: “boxers or briefs?” More often than not, these student-athletes prefer their sausage and eggs to be firmly secured. 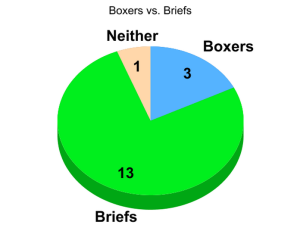 Note: boxer briefs count as briefs. Toledo linebacker Trent Voss was very vocal about why he wears boxers. Either UMass quarterback Blake Frohnapfel scores as many touchdowns in the bedroom as he does on the gridiron or he’s just really concerned with what his underwear look like.